It's time for another fun sketch from the My Favorite Things Challenge & Inspiration Blog! Enjoy creating with this simple, yet versatile sketch. 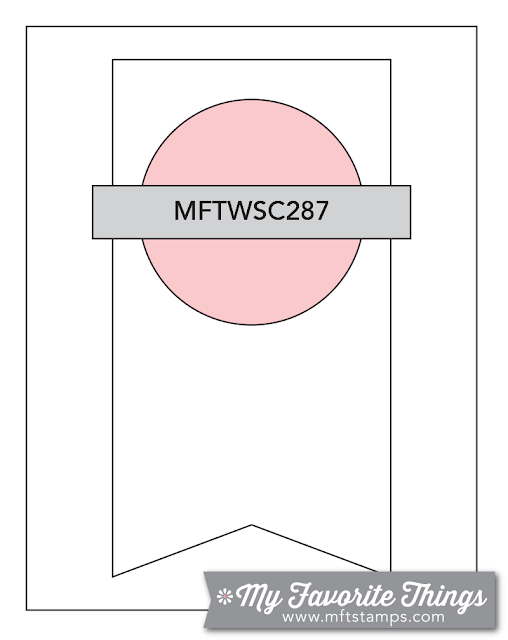 Below you'll find Sketch 287. Create cards, scrapbook layouts, home decor, treat containers, mixed media, etc. using this week's sketch and be sure to link your project below for a chance at the weekly My Favorite Things Gift Voucher worth up to $20. Join me in welcoming back Angela Rivera one last time as our Guest Designer this month! You can follow her at her blog Angel's Creative World HERE. Angela went for a pretty direct interpretation of the sketch simply substituting the sunny girl from the Fun in the Sun stamp set in place of the main circle. The large flag is the perfect place to showcase a pretty patterned paper like the one she chose from the Fresh Squeezed Chevron Paper Pack. It looks like a pool full of cool water! The My Favorite Things Creative Team has been busy getting creative! Let's see what they have up their sleeves for Sketch 287! Julia also goes for a direct interpretation adding in lots of fun interest with the background stamping on the main panel and the flag. 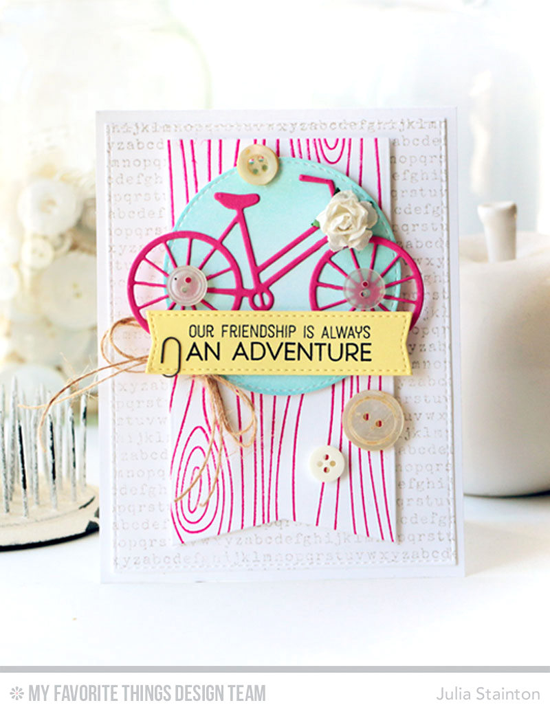 The circle is the perfect spot to feature one of your favorite Die-namics like the Bicycle. The delicious Julia-style additions of buttons, flowers, twine, and a tiny paper clip make this design extra special. Patterned paper is the key to making Debbie's design stand out in a crowd! 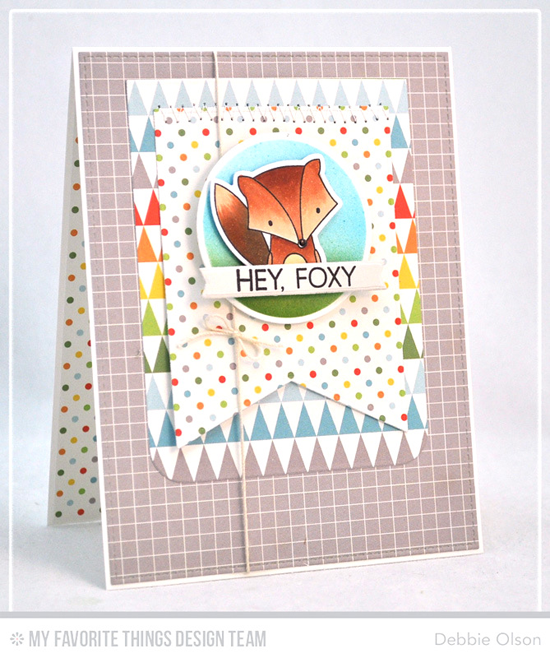 Because she wanted to feature the fox from the Sweet Forest Friends stamp set, she needed to give a lot of weight to her design, and the patterns do the trick! I love how she added a little bow and homey stitching. Keisha creates drama with the Simple Leaf Flourishes Die-namics and a juicy color palette. 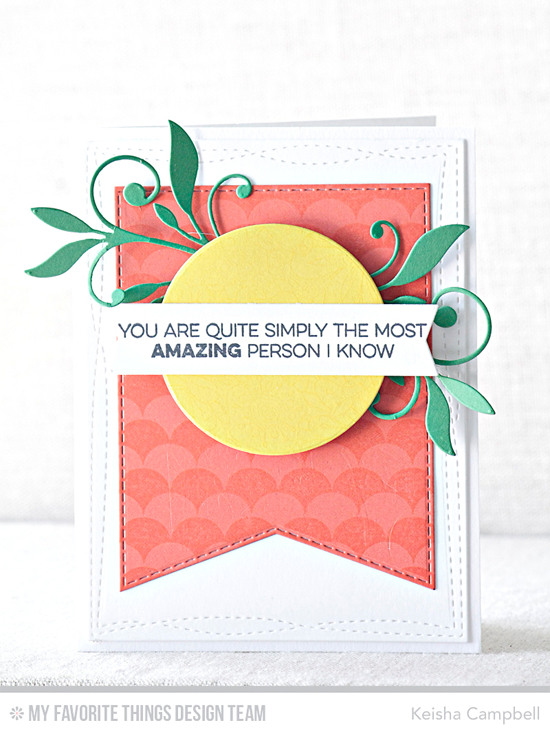 The stitched Die-namics and Scallop Background stamp add flair and depth to her design. 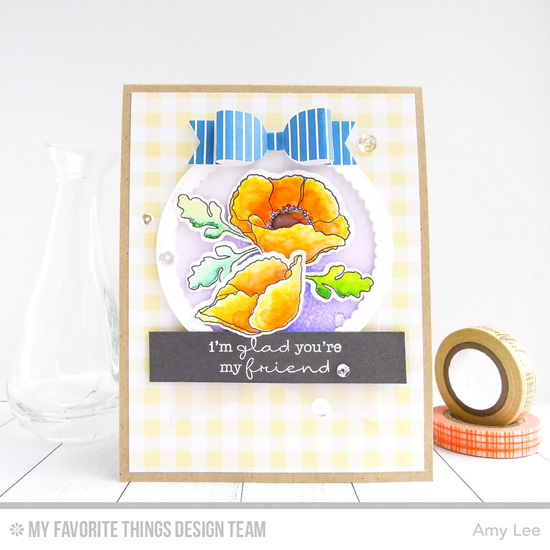 Amy took a sweet and pretty approach to her design with gingham, a bow, and a scalloped circle to feature her pretty flowers from the Delicate Pretty Poppies stamp set. Though the flag is missing from her interpretation of the sketch, the bow hearkens to that part of the design. 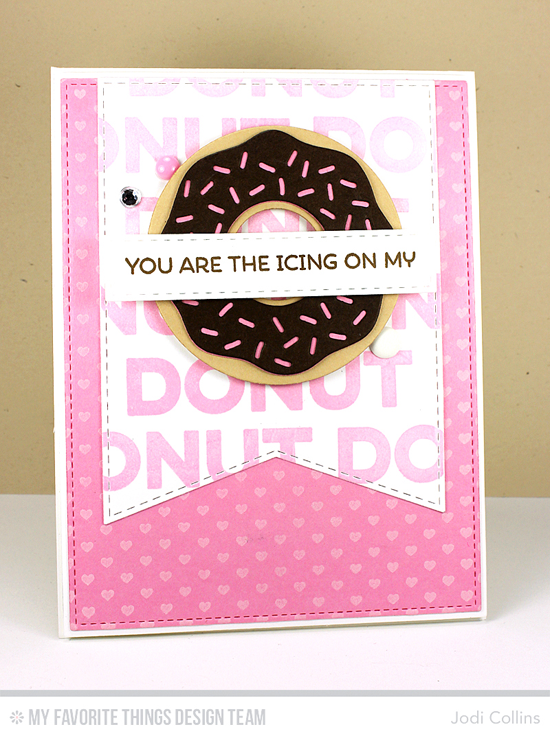 Jodi's sweet tooth is obvious when she turns that circle into a donut using the Donuts Die-namics! 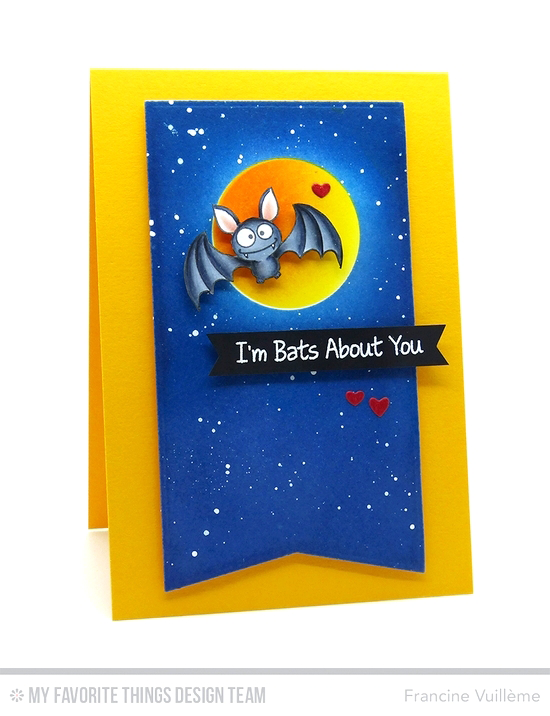 The delicious color combination, Tiny Hearts Background, and repeated stamping on the flag make this card a real treat! Francine envisioned the circle as a moon and created this cute and spooky design using the super fun Witch Way Is the Candy? stamp set. What a rich and gorgeous color combination, and that night sky is absolutely dreamy! Congratulations, MeganBeth! You are the randomly selected winner of last week’s sketch challenge. You can view all the entries for last week’s challenge HERE. You have until Tuesday, July 5th, at noon EDT to add your link and be eligible for the prize of up to $20 in MFT Cash to be spent in the MFT boutique. Winners are chosen at random, so everyone has a chance! The weekly prize is a $15 Gift Voucher to My Favorite Things, but if you use MFT stamps and/or dies in your project, you’ll receive an extra $5.